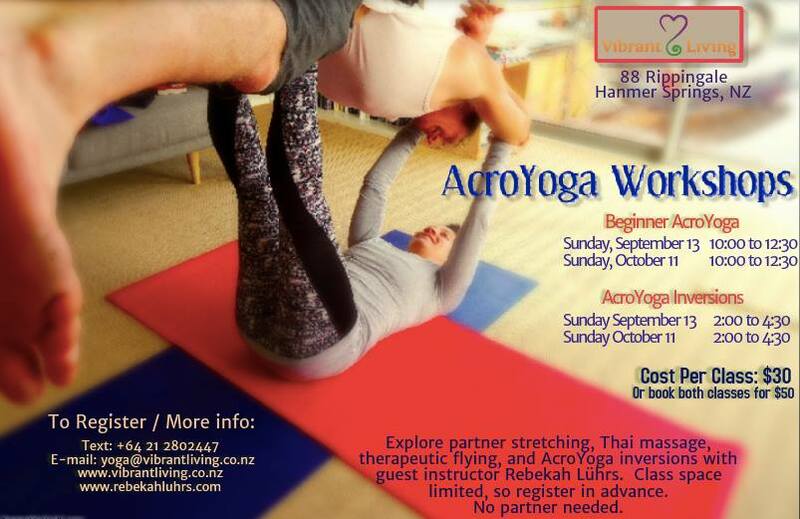 2015 Acro Yoga Workshops in Hanmer Springs 2.5 hours in duration $30 per person. Scroll down to check out fun video of previous workshop held at V.L. in Hanmer Springs. Workshops Facilitated by Rebekah Luhrs from the U.S.A. and held at Vibrant Living Retreat. Complete Beginners Welcome Aged 18yrs and over. A video of beginner Acro Yoga with Rebekah Luhrs held in Hanmer Springs in June / July 2015.